Nothing can throw your healthy diet off like a screaming hangover, amiright? And tacos. Tacos are the key. 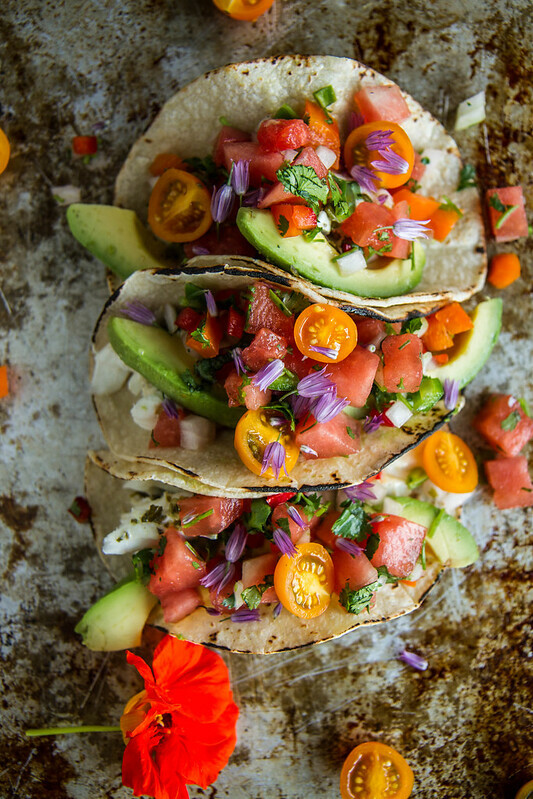 Like these gorgeous Grilled Halibut Tacos with Watermelon Salsa. Can you believe that we received a gorgeous slab of halibut as a hostess gift? Have you ever such an awesome thing?! It had been caught in Alaska the day before and I can’t tell you how unbelievably fresh and pristine this fish was. I grilled it up with some simple (but a little kicky!) 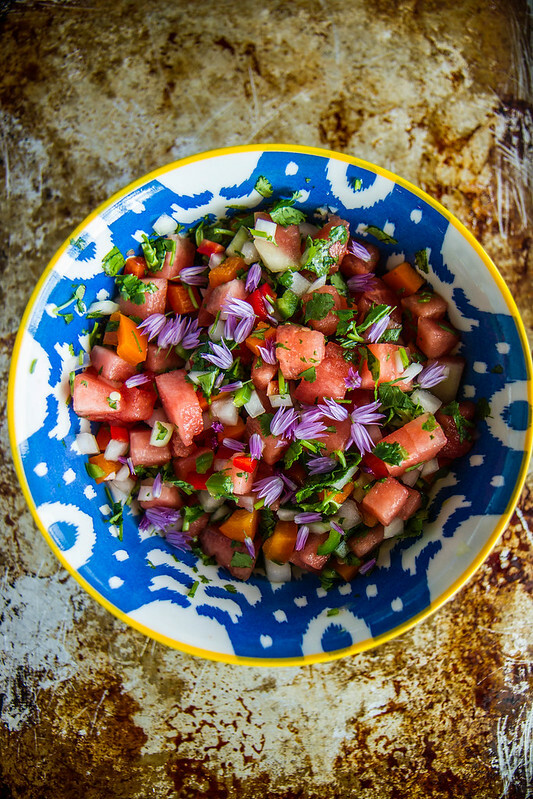 flavors and topped it with the most light and refreshing salsa that is packed with juicy watermelon. The combination is a perfect pairing. This is a perfect dish for summer grilling- try it soon! Preheat the grill to medium heat. Place the fish on a piece of foil and place onto the BBQ. Cook 3 -5 minutes on each side, depending on the thickness of the fish. You want it to be just cooked through. When you are done set the fish aside and turn the grill to low heat. Let the fish rest for a minute while you spread the vegetable oil over the tortillas evenly and grill each one briefly over low heat until it is barely charred at the edges and hot, soft and pliable. Season the fish with a little extra kosher salt. 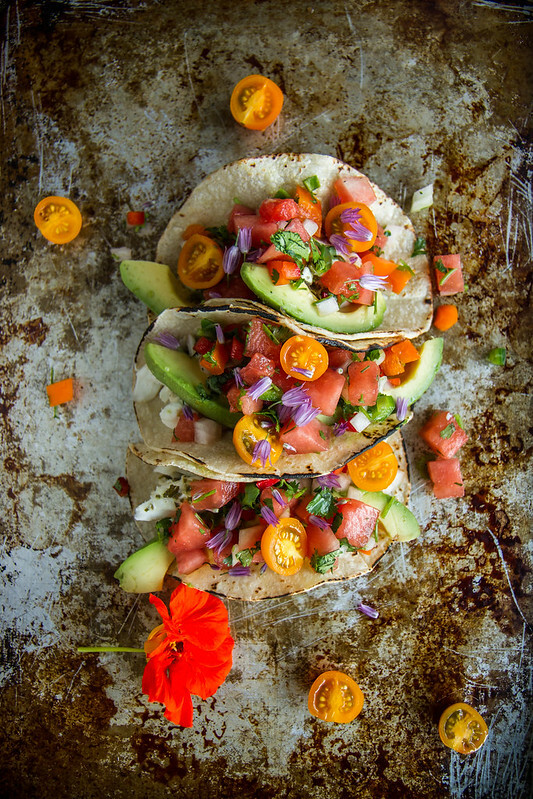 Divide the fish between the tortillas and top each generously with the watermelon salsa and a wedge of fresh avocado. 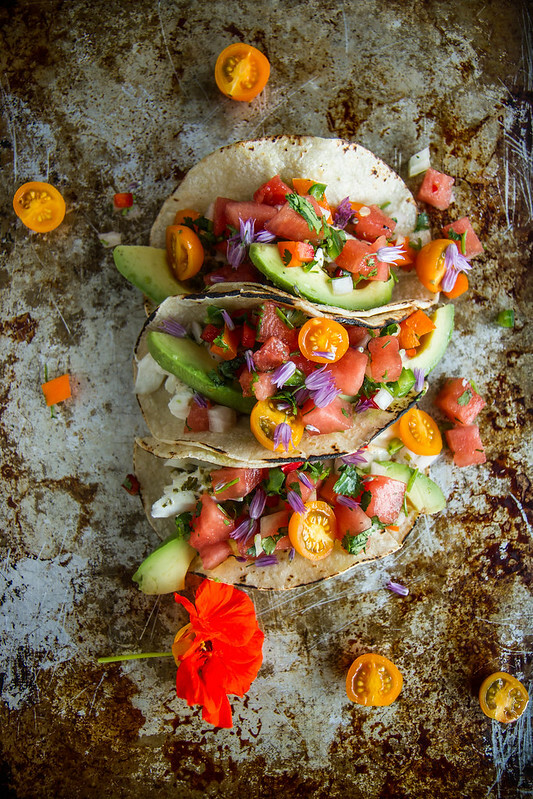 hangovers are awful, but these – halibut tacos with watermelon salsa – yess!!! That’s an amazing gift, and I agree the only thing to do with a hangover is eat….a lot!!! I love fish tacos and that salsa is the prettiest! The tacos look like a framed artwork! Happy feasting! We made these for dinner for company last night…my husband had to grill in the snow! It was worth it…SO YUMMY!!! Served with homemade spicy black beans and a bowl of rice!!!! Thank you for a GREAT recipe!